There is nothing too fancy here. Just a delightful 1950s scene of kids playing house and pretending to wash dishes. There were no markings on the back of this photograph. 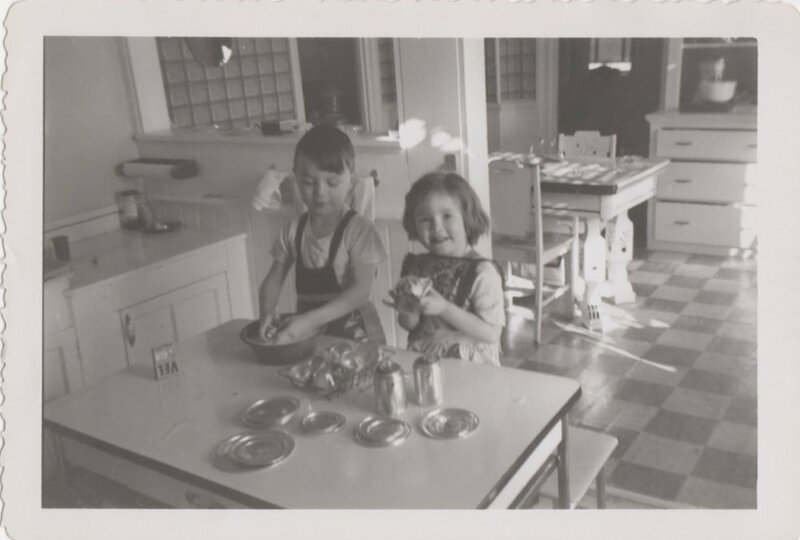 Given the the decor of the kitchen and the paper the photo is printed on I estimate this scene to be mid 1950s. Would you agree? This appears to be a miniature VEL detergent box. VEL was first introduced by the Colgate company in the late 1940s. It was billed as: "MarVELous for Dishes, Stockings, Lingerie, Woolens." The dishwashing set in the Pic of the Week #35 appears to be the same as the DollDoDish set example shown above, at least in terms of the washing bowl, the dish rack, and the VEL box. I've seen other vintage toy sets that include aluminum dishes, but not the VEL box. Bonus points to you if you can find a link to the precise set shown in the picture. A main selling point of VEL seemed to be the promise that it wouldn't burn your hands. That's an important feature to have in a detergent, I suppose? Check out these (dated and sexist) advertisements to see what I mean. Do you "Feel the heat?" Do you remember VEL detergent being used in your family home? What were some of your favorite toys growing up? How did the play of kids in the 1950s differ from the play of kids today? What do you miss most about the 1950s if you lived during them? What do you think, feel, and wonder about as you view some of these vintage advertisements for household products?